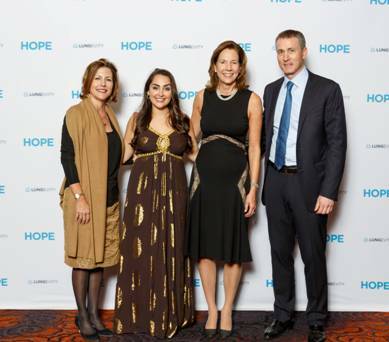 On Thursday, Nov. 2, LUNGevity Foundation, the nation’s leading lung cancer focused organization, brought together New York City’s top business leaders, researchers, philanthropists and lung cancer survivors for the Foundation’s fifth annual Celebration of HOPE Gala at the Mandarin Oriental New York. Emceed by NBC 4 11 a.m. and 4 p.m. Weather Anchor Dave Price, the gala spotlighted the unprecedented progress in lung cancer research that is giving survivors reason to hope. The evening included the presentation of awards honoring 27-year-old lung cancer survivor and advocate Amanda Kouri and Jill DeSimone, Senior Vice President, US Oncology, Merck, who accepted the award on her company’s behalf. Both were recognized for their contributions to the lung cancer community. 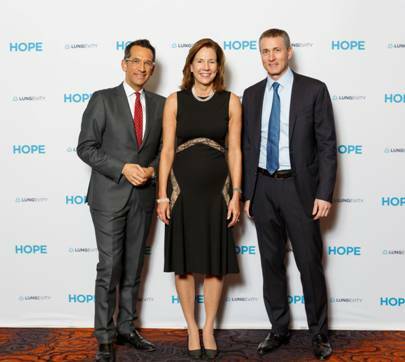 Gala Vice Chairs Alexander Stern, Chief Operating Officer, Chief Executive Officer-Financial Advisory, Lazard and Peter Babej, Global Head of Financial Institutions, Citigroup / Global Banking; Gala Honorary Chair Lynne Doughtie, Chairman and CEO KPMG LLP; and Dinner Chairs Rosemary and James Marquardt were among many New York business leaders and philanthropists in attendance. (From left to right) LUNGevity Foundation’s Celebration of Hope Gala Emcee Dave Price, Weather Anchor for NBC 4 New York’s 11 a.m. and 4 p.m. newscasts, NBC 4; Honorary Chair Lynne M. Doughtie, Chairman & CEO, KPMG LLP; and LUNGevity’s Board of Directors President and, HOPE Gala Vice Chair Alexander Stern, Chief Operating Officer, Chief Executive Officer-Financial Advisory, Lazard.